From the Suzanne Neville Songbook collection- a rare opportunity to fall in love with this fabulous ‘Heather’ gown. 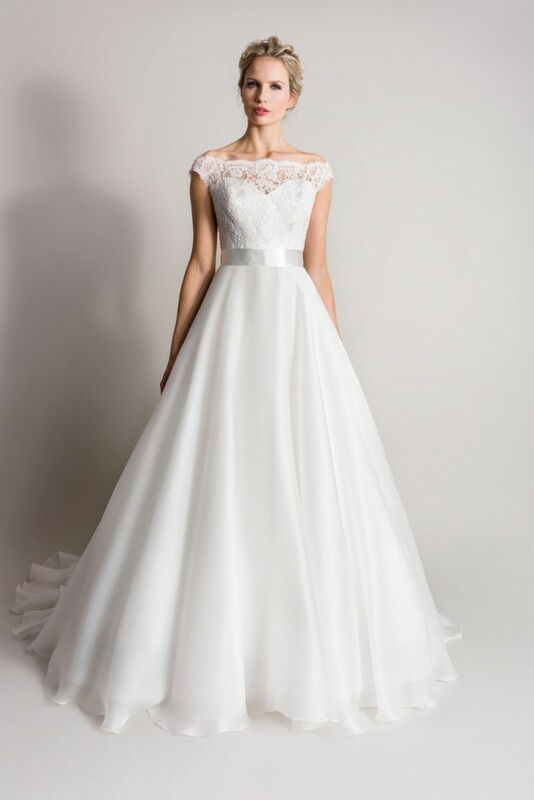 This stunning A-line gown incorporates a soft flowing duchess silk organza skirt which is perfectly complemented by the corded lace off the shoulder bodice; giving the dress a soft, feminine feel. Retail price was between £3650-4000. Size 12. I’m a size 10-12 Uk, 5ft 4 and the dress fitted perfectly. Dry cleaned by a high end heirloom specialist. Some minor staining from the ground along the trim in the underskirt but this isn’t visible. Fully steam pressed and in designer bag. Excellent condition and an absolutely beautiful gown, truly one to make you feel very special on your big day. The only alterations completed before the big day to the original dress was a small shortening to the trail but it is still very full as you can see from the pictures. Also there are some built in cups on the bodice for extra support and a couple of buttons to bustle the skirt for the evening. The whole silk organza skirt has been completely replaced (original skirt got a small rip on the day) by a very high end seamstress (c £800 to replace) so the dress is as good as new!